Best Organic Juice Bar in LA. 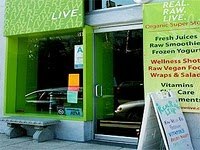 They have great Organic juices, smoothies, snacks and cleanses. Also they believe in giving back as they take 10% off your order if you are a KCRW member! My favorites are the Ginger Snap and the Rockstar! Or as I like to call this place: "Scoop of Earth".